Is Toronto’s famous sushi burrito a symbol of cultural appropriation? I’ve been a fan of sushi burrito since it first came to the city through Rolltation, a rapidly growing joint at Dundas Street West and University Avenue. My Instagram and Facebook feeds were filled with the innovative food creation, which I saw garnered mixed reviews from Torontonians—so I decided to try it out for myself. As an avid sushi lover, I enjoyed the Japanese-Mexican fusion of raw salmon and assorted veggies with the convenient, wrapped packaging of the whole product. But as I watched multiple videos advertising the product on Facebook, I noticed some comments saying things like, “this isn’t real sushi,” and “I’m offended by this product.” These comments were later deleted, but they didn’t lose their effect as I continued to ponder the significance of those accusations. The comments echoed sentiments expressed in the case of Kooks Burritos, a taco truck run by two white women that was shut down. Owners Liz Connelly and Kali Wilgus of Portland, Ore. admitted to “peeking into the windows of every kitchen” on a trip to Puerto Nuevo, Mexico. They returned to the U.S. to create their own (short-lived) venture, inspired by the ideas they saw on vacation. Their story received a great deal of public outrage, as reported by multiple news organizations. The one thing I kept seeing littered throughout every piece was the term “cultural appropriation”. For those who don’t know, cultural appropriation, paraphrased from the Oxford Dictionary, is the unconsented and inappropriate taking of the cultural symbols, customs or ideas of one group and using it for another culture’s gain. If that definition translates to the food industry, restaurants that take the food from a culture that isn’t native to their owners’ and profit from that difference are guilty of cultural appropriation. Is it really so simple, though? 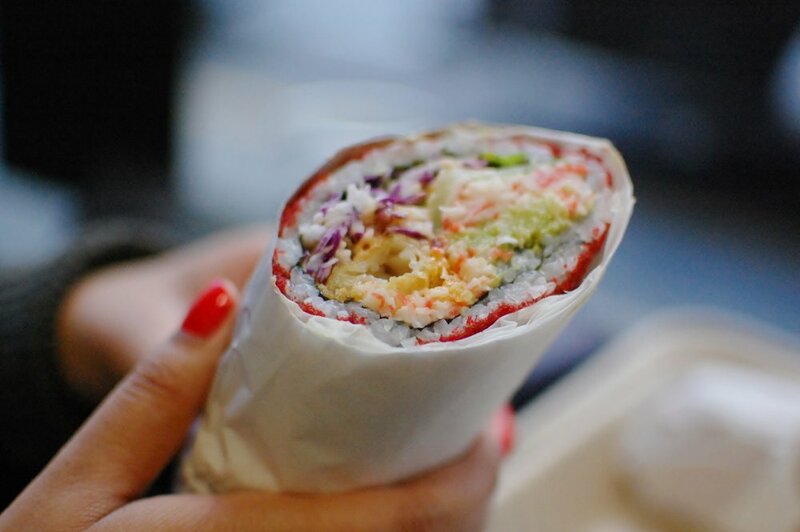 In an interview, Day Wong, a co-founder of Rolltation, said that the company was inspired by New York’s creation of the sushi burrito. Wong said he and the other co-founders saw potential in the interesting concept, and thought it would do well in downtown Toronto. Wong also mentioned that of Rolltation’s four co-founders, none are of Japanese descent. “That doesn’t mean the group isn’t knowledgeable about sushi,” said Wong. I wondered how traditional Japanese restaurants viewed the invention, so I spoke to Kei Hashimoto, who is the assistant manager of Kaiseki Yu-zen Hashimoto and the son of the owner. Hashimoto explained that the goal of the restaurant is to “promote an authentic experience” of what it’s like to eat at formal restaurants in Japan. When asked about his feelings toward the sushi burrito, which mixes Japanese and Mexican cultures, Hashimoto said he took no offence. “There needs to be a gateway into a culture. [To help others] understand a particular culture, [cultural restaurants] need a way to entice their interest, in terms of where things have developed from,” said Hashimoto. He went so far as to call the Rolltation enterprise “helpful”, because they it lessens the load on his restaurants to explain the origins of the food. So there appears to be no beef (so to speak) between Rolltation and traditional Japanese restaurants. However, that lead me to the question: do cultures own their food? If they don’t own their food, is it even possible to appropriate their dishes? Sarah B. Hood, a member of the board of the Culinary Historians of Canada, said that the issue is more complicated than that. “It is in the nature of food to be shared, and it’s in the nature of food to change. In most cases, even a home cook who cooks the same meal over and over again is likely to try new things every time they make a dish,” said Hood. Hood stated that she doesn’t think it’s possible for a culture to own a dish, using spaghetti as an example. Ruth Tam, a Washington-based writer, believes that it is possible to appropriate food from a culture. She wrote a Washington Post piece entitled “how it feels when white people shame your culture’s food — then make it trendy” which was based on her personal feelings in reaction to the rise of Asian food in American restaurants. I asked her where the lines were between cultural appropriation and cultural appreciation of food. She said it all went back to giving acknowledgement to the cultures and techniques chefs source their food from. “If you take food and you say, ‘Here it is, this is all my work,’ and you don’t explain where you got it from or what techniques are being used, then it verges on cultural appropriation — especially if you get capital for that,” said Tam. “Cultural appreciation is when you show your work and show your relationship to it as opposed to taking ownership over it without citing your sources,” said Tam. So is the sushi burrito a symbol of cultural appropriation? Wong was transparent with me about its New York origins, but I don’t remember seeing anything about that on any of its social media. They have clear glass windows separating their customers from the food preparation, showing them the sushi burrito-making process in front of their eyes. Does that constitute “showing their work”? Perhaps if we start being open and honest with our food as we share it with people, the question of cultural appropriation in food won’t exist anymore. This piece was edited by Emerald Bensadoun.